Diamond engagement rings should reflect your style and personality, but many buyers don’t always know that they can design beyond the sleek and shiny traditional ring. Rustic diamond engagement rings incorporate an artisanal aesthetic and a refined beauty that so perfectly complements the individual who favors organic design and casual elegance. Rustic diamond engagement rings can feature intricate carvings inspired from nature or perhaps organic accents like wood and uncut or earth-hued diamonds. Some rustic diamond rings may even showcase rugged textured finishes that give the illusion of stone. To capture rustic beauty, choose colors and details that are found in nature and let the palette and design of the wilderness serve as ideal inspiration. When you’re designing unique rustic diamond engagement rings, however, keep in mind the recipient’s personal preferences in regard to colors, metal and structure. The perfect ring takes inspiration from the individual…and his or her style and influences. You might wish to incorporate a certain wood as a nod to a favorite hiking spot, a raw uncut diamond (for a true ‘diamond in the rough’) or the recipient’s most beloved hues. To create your rustic romantic ring, you also can pull inspiration from these styles and designs. Remember, though, that the perfect rustic engagement ring should embrace individuality! 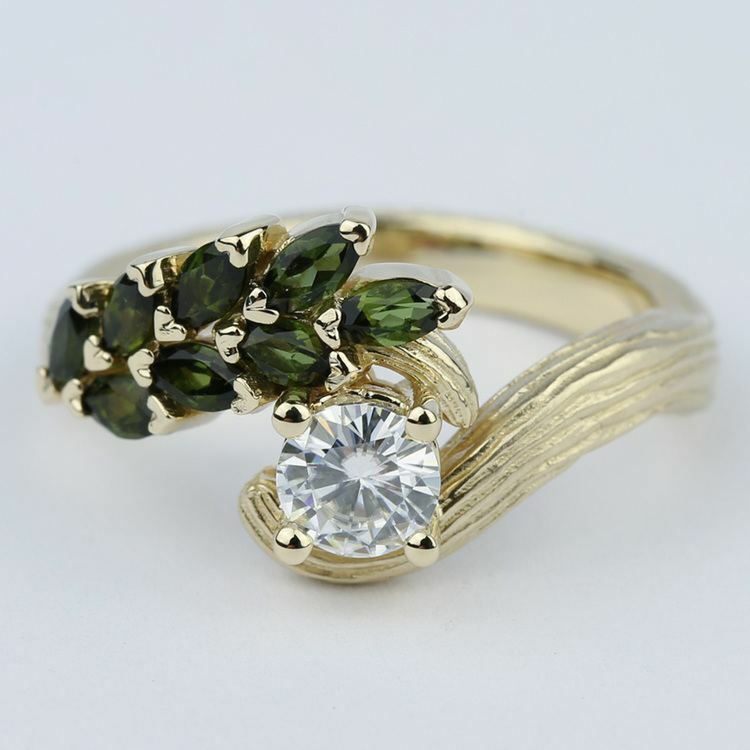 The wilderness and nature inspire the design for this amazing tree branch diamond ring. A branch is carved and etched in yellow gold and is accented by small green leaves of emeralds. A round brilliant diamond serves as the centerpiece of this rustic ring. 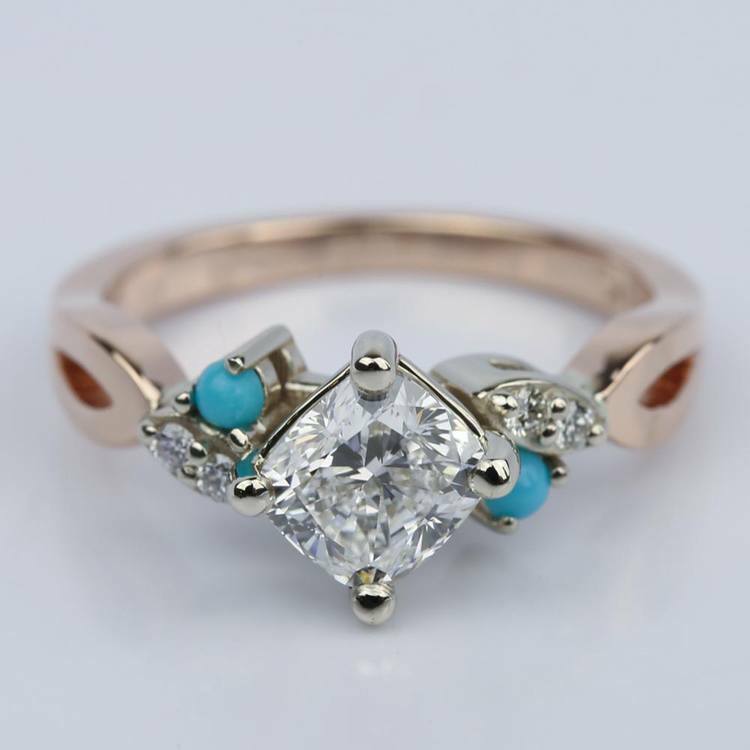 Elements of nature also inspire beauty in this ring that matches warm earthy rose gold with a centerpiece cushion cut diamond, accented by two small beads of sky blue turquoise. The setting of the diamond creates an almost star-like appearance and the sky-blue beads of turquoise can be a representation of the sky or water. Nature is designed perfectly imperfect. Beauty isn’t always symmetrical, and balance is sometimes found within imbalance. Design a perfectly asymmetrical ring that combines colors of nature with the perfection of a clear diamond. Turquoise once again features prominently in this design. The beautiful blue bead sits to the right of the diamond while an oval pale green peridot rests to the left. Tiny dots of diamonds also decorate the white gold band. 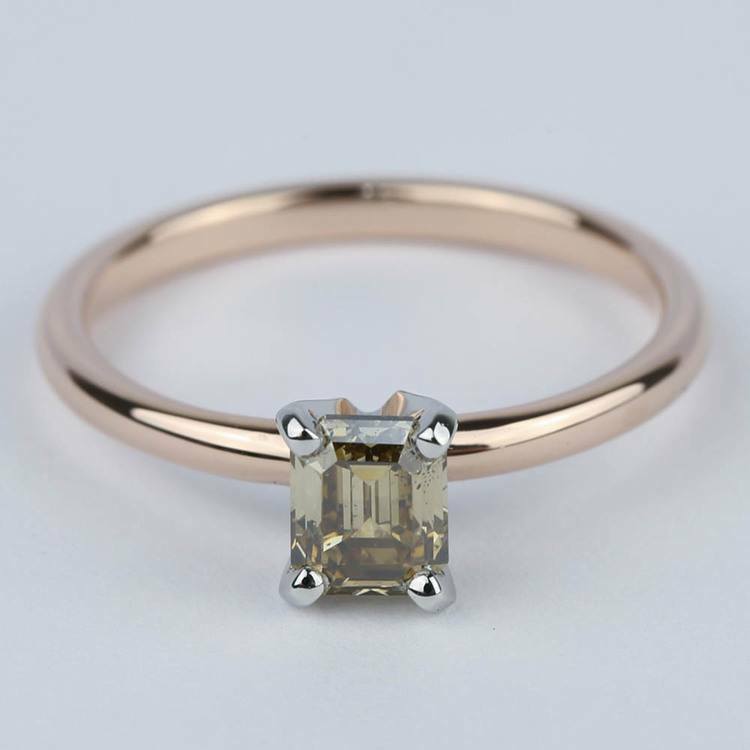 Warm earth tones create a stunning engagement ring design. Set within a blushing rose gold setting a rich brown diamond serves as the centerpiece of the rustic design. While warm hued diamonds might not exude the same brilliance as a white diamond, the rich elegance is a perfect complement for those who want a more subdued and sleek stone. The step-facet cut of the emerald shape showcases the stone’s nearly flawless clarity. Raw metals are never shiny and flawless. Embrace the beauty of a more natural and rugged appearance by choosing a hammered band for a solitaire diamond…like the pearl engagement ring above. Hammered metal gives the ring an artisan-inspired elegance. For an amazing organic appeal, choose a raw uncut diamond for your rustic ring. 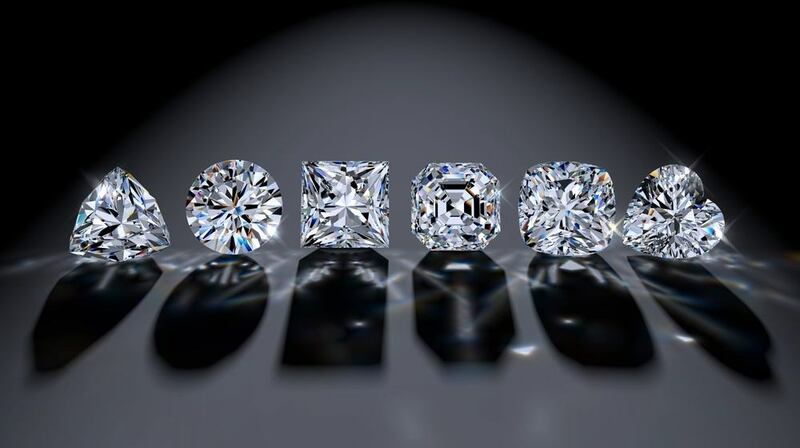 Yes, you can buy uncut diamonds… and they also may be less expensive than perfectly polished cut stones! 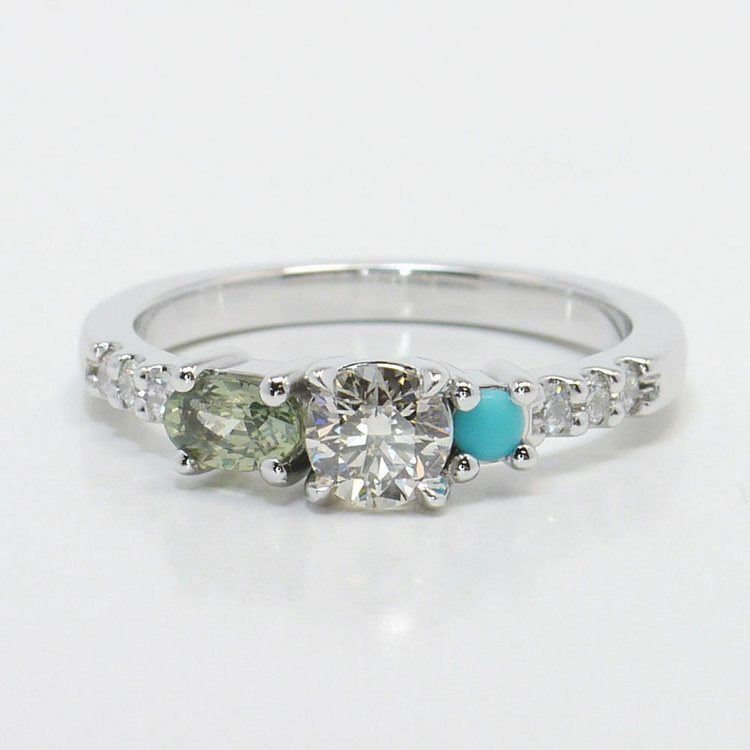 You may also set raw gemstones next to a raw diamond for a back-to-basics beauty…and a truly organic ring! Rustic diamond engagement rings are the ideal choice for individuals who seek a subdued beauty and a unique design. Choose rings with elegant carvings inspired by nature, that offer hues colored by the elements or that create texture with hammered metal bands. 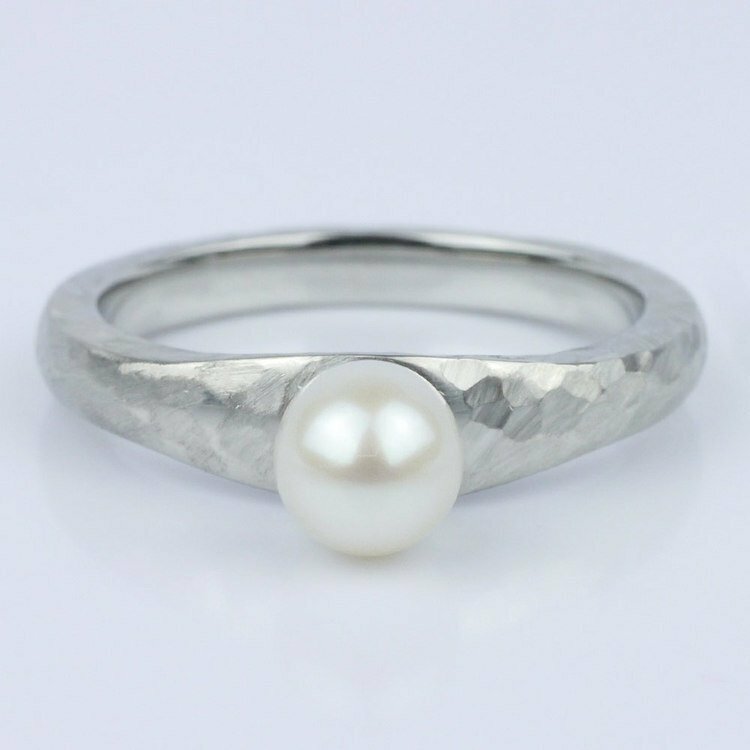 Rustic is defined only by the designer, so create a ring that depicts your perfect rustic beauty and Brilliance.